Тhe transportation sector has emerged as one of the driving forces of Chilean economy, expanding its value added at a CAGR of 5.9% between 2010 and 2015, and reaching a share of 4.9% in the country’s GDP in 2015. In the 2015-2016 Global Competitiveness Report, published by the World Economic Forum (WEF), Chile ranked 48 out of 140 countries in terms of quality of overall infrastructure, having the second-highest score among the countries of South America, after Ecuador. Over 2010-2015, some segments of the industry (e.g. road, air and maritime passenger transport) grew rapidly, driven by both internal factors, such as mining sector development, and external factors (cruise tourism and Bolivian external trade). In 2015, maritime and rail were the two favourite modes of cargo transport, with shares of 52.5% and 33%, respectively, according to EMIS Insights estimates. Meanwhile, the rail and air modes led passenger transport, with shares of 41% and 32%, respectively. 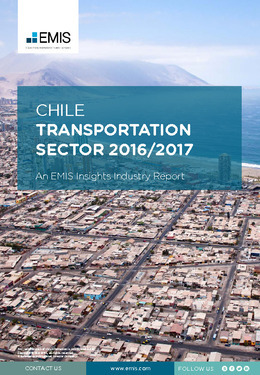 This report provides a complete and detailed analysis of the transportation sector for Chile. EMIS Insights presents in-depth business intelligence in a standard format across countries and regions, providing a balanced mix between analysis and data. Gain an understanding of the regulatory environment for the sector in Chile.